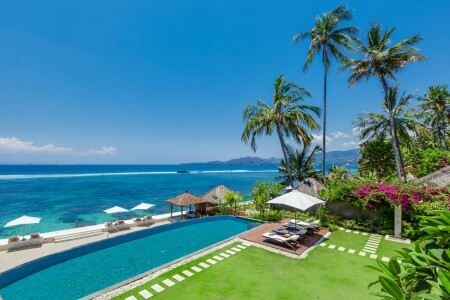 A magical and private haven villa Puri Nirwana (Heavenly Place) is nestled absolute beachfront on the eastern coast of the Island of the Gods. 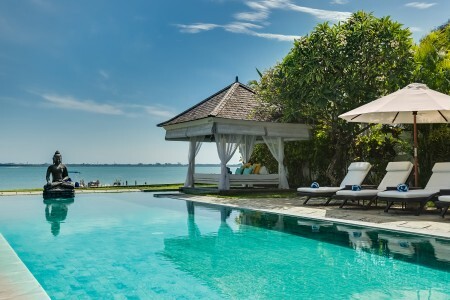 With 15 full-time staff to cater to your every whim, sixteen-meters long beachfront swimming pool with jacuzzi area and a fully operational private Spa in exquisite gardens, Puri Nirwana is the perfect retreat for those seeking luxurious and private relaxation. 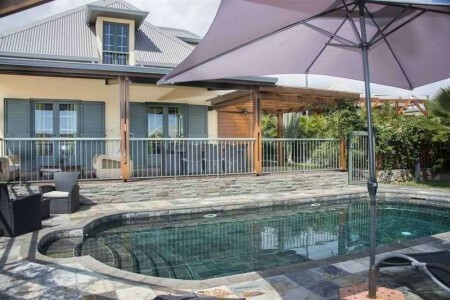 Stunning 6 bedrooms beachfront estate perfect for big family or group. 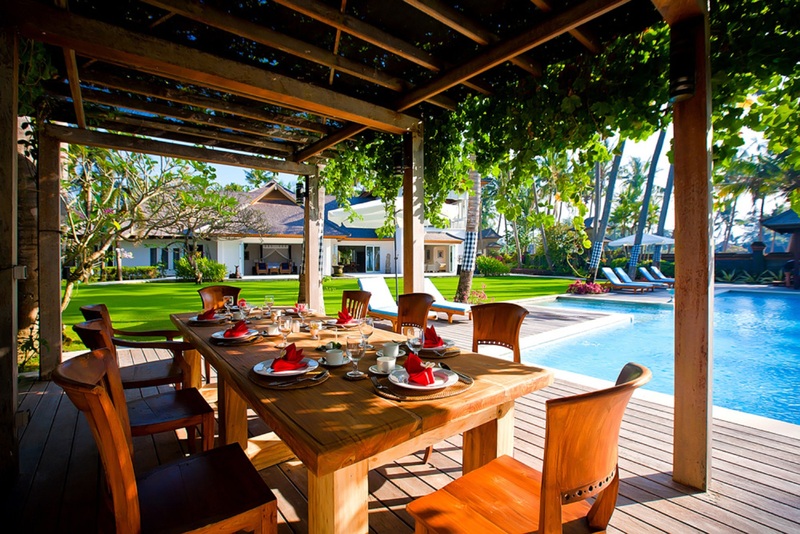 It can be rented as 4-bedroom villa for 8 people on reduced price (except X-Mas and New Year). 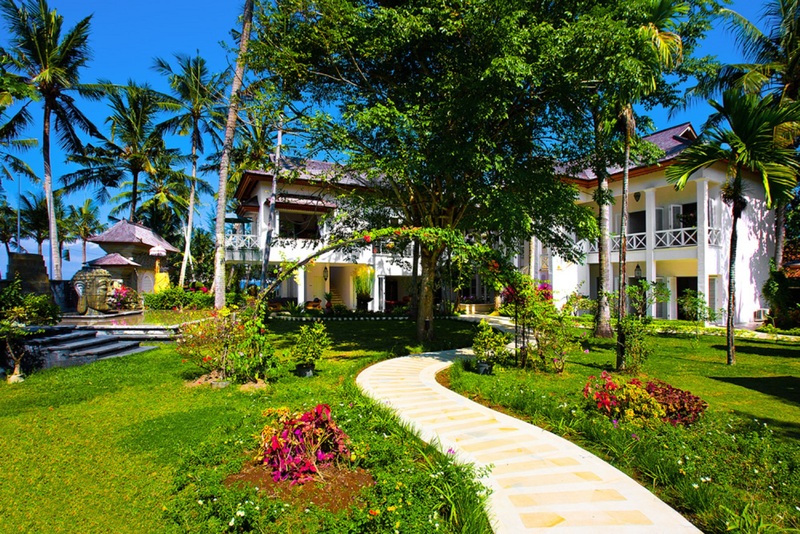 The Villa is a private plantation style mansion enjoying absolute beach front in Cucukan, a small fishing village across the road from the Bali Safari & Marine Park. 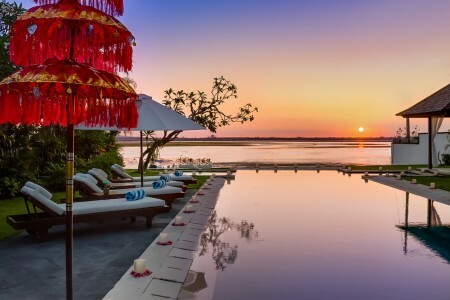 It is located in about half-an-hour drive to the North from the charming Sanur and in about another half-an-hour drive to Ubud, the Bali's culture and artisans center. The location is very convenient to explore the real Bali, visit the Mother Temple of Besakih, the stunning Water Palace of Tirta Gannga, and enjoy not to be missed colorful Bali Agung Show in the Bali Theatre which is a part of Bali Safari and Marine Park. Adventures abound in the surrounding area including the Elephant Safari Park in Taro village, whitewater rafting on the mountain rivers, ATV riding, bicycling and trekking in the rice fields. 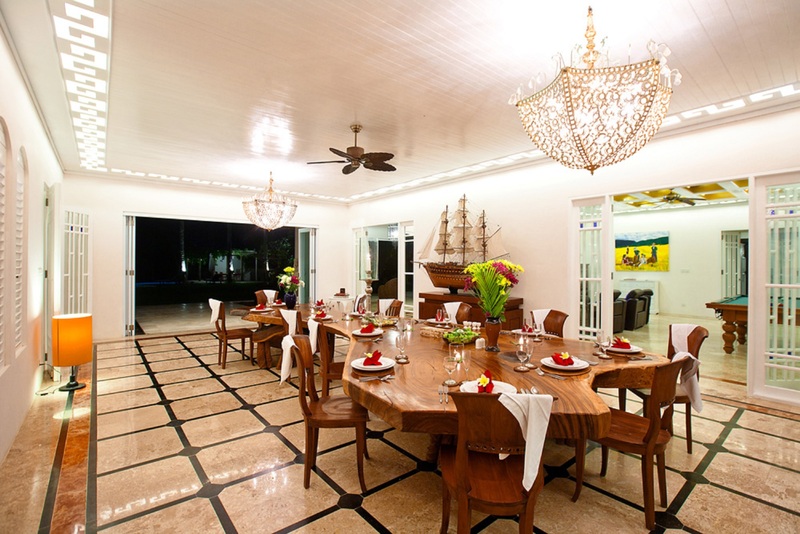 From the entrance, guests proceed to the sitting room, which has floor-to-ceiling French-style folding doors opening to the pool and garden. Adjacent to sitting room is the formal dining room and next is the entertainment room; another set of French doors leads from here to fully equipped kitchen. Three of the six air-conditioned bedrooms, including the master, are situated downstairs, and three are situated upstairs. Each has an ensuite bathroom. Also located upstairs is the lounge, complete with a bar and dining table. The lounge also doubles as an optional seventh bedroom. 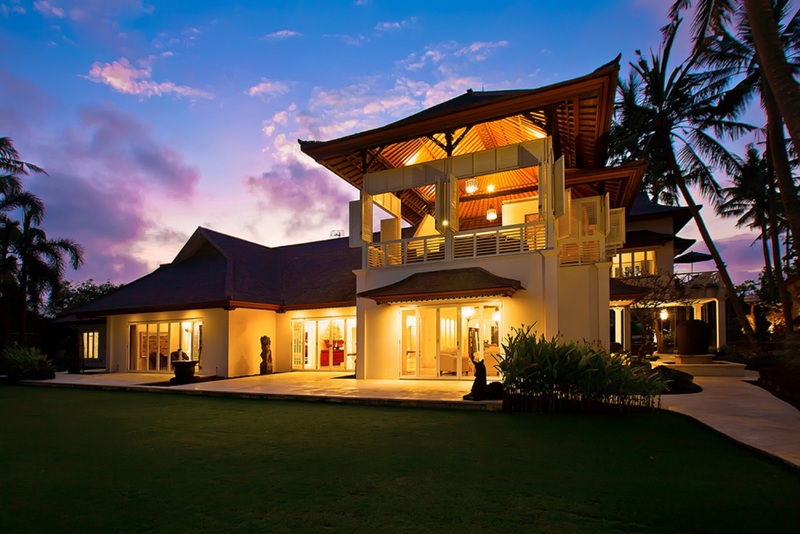 This six-bedroom beachfront villa has been built to make the most of the natural ocean breezes, while its spacious layout means that a large group of people could stay here and still lose one other in its depths. 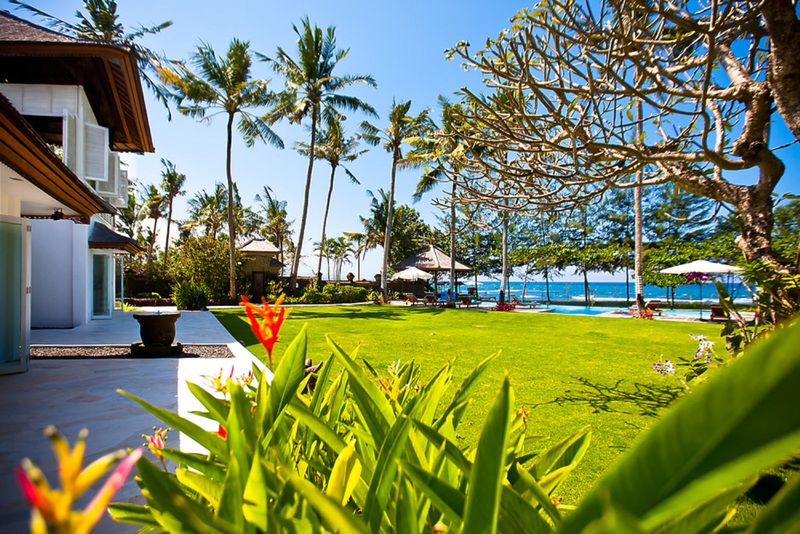 Extensive gardens wrap around the property, fronted with a glass wall to ensure a full view of the ocean. Outdoor facilities include a dedicated children's activity area and two fish ponds filled with exotic koi fish, catfish and tortoises. A beautiful Buddha statue presides over the reflection pool. 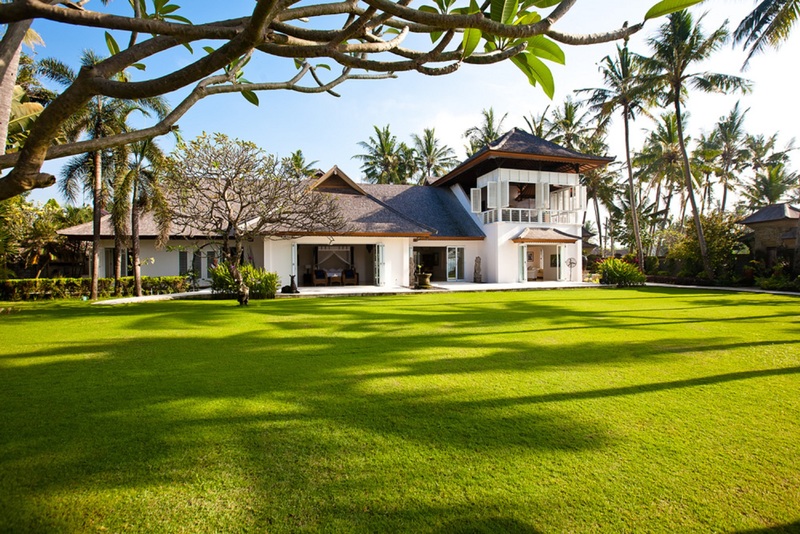 Manicured lawns lead to the 16 x 5 metre beachside swimming pool and adjoining Jacuzzi. 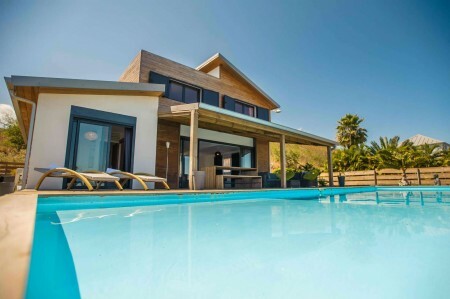 The pool is bordered by a timber deck from where guests can watch the waves crash on the sand, while lying back on the outdoor sunbeds or bean bags, or in the cushioned relaxation bale. An alfresco dining pergola draped in passion fruit vines offers the ideal spot for evening cocktails or dinner at a table for ten. 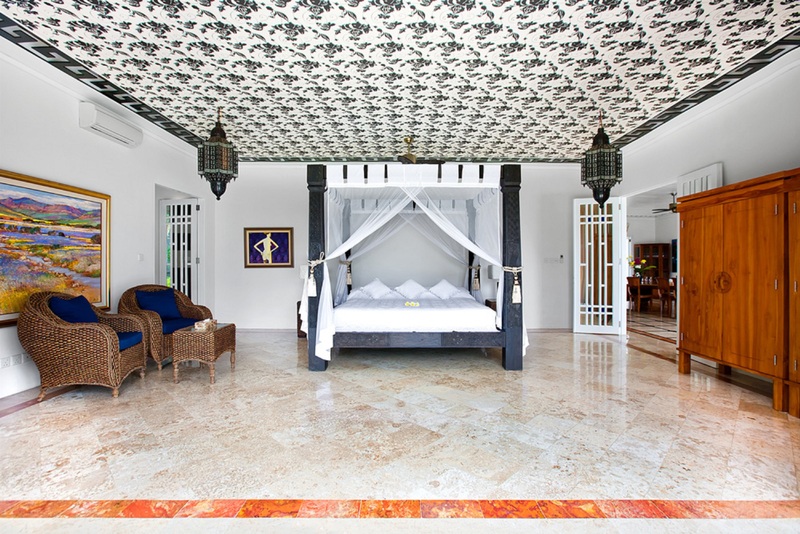 Puri Nirwana's huge and luxurious, air-conditioned Master Suite rests on the ground floor and is furnished with a four poster king-size bed. 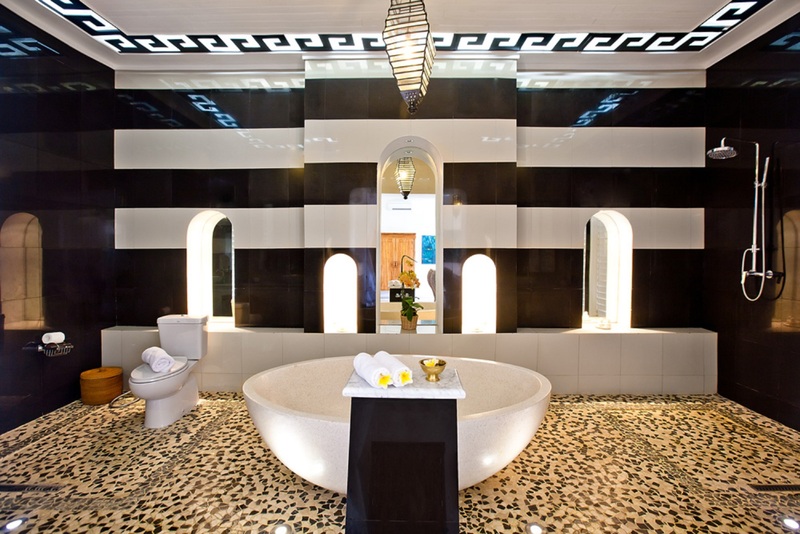 The enormous ensuite bathroom acts as an additional spa facility and is suitable for disabled guests with its walk-in rainshower, an oval bathtub and twin washbasins. Accessed by wide verandas, each of the four air-conditioned guest suites (two downstairs and two upstairs) is situated in the Garden Wing. Each is furnished with a king-size bed complete with a queen-size trundle bed underneath. 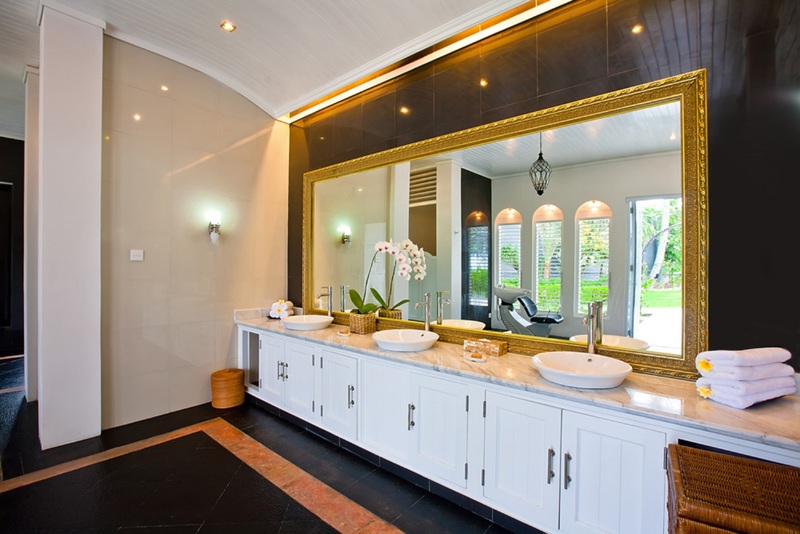 Each ensuite bathroom is fitted with a walk-in shower and large bathtub. 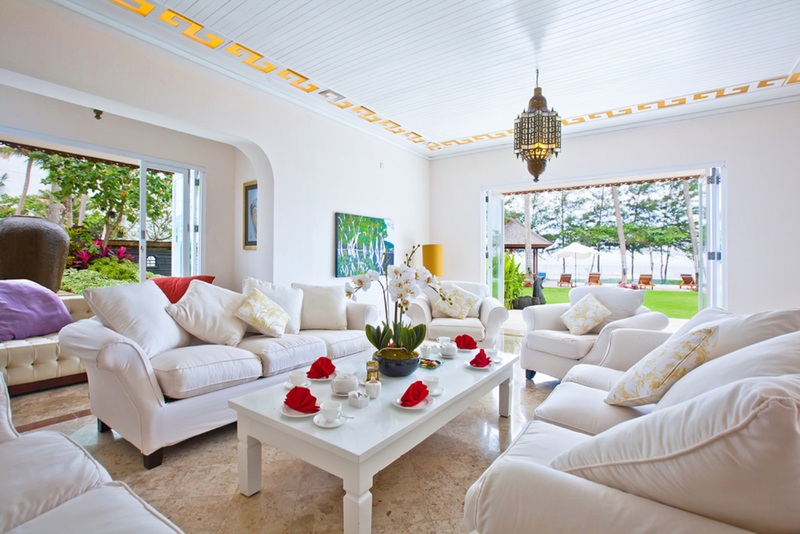 The Ocean View Suite rests within an annex on the upper floor of the villa. 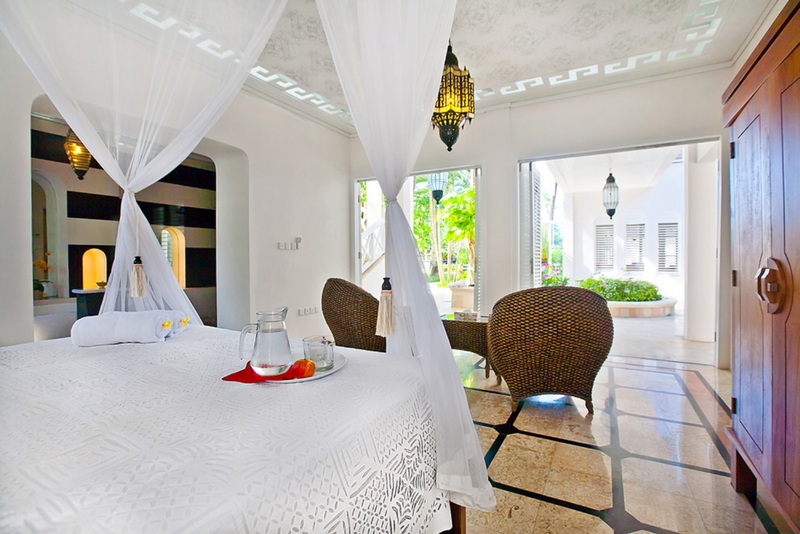 Furnished with a four-poster king-size bed, sofa and writing desk, and decorated in white, the room is fitted with picture windows and glass doors that open to a private balcony with a glorious ocean view. 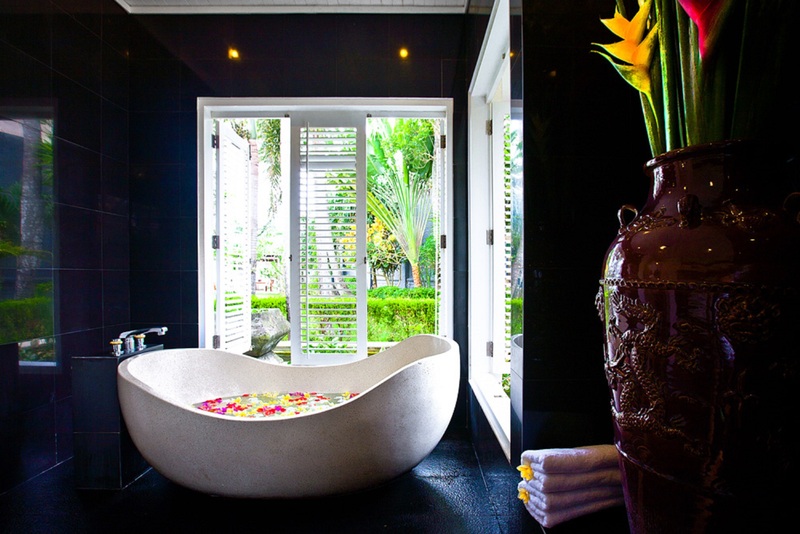 The adjacent bathroom is fitted with a rainshower and is shared with the adjoining lounge – a delightful breezy room with folding wooden shutters, 180-degree-views, a huge semi-circular sofa, a bar, and a dining table for six. There is also an entertainment corner with a sofa, armchairs, a satellite-channel TV and a DVD player. A queen-size netted bed provides the option of a seventh bedroom cooled by natural breezes. 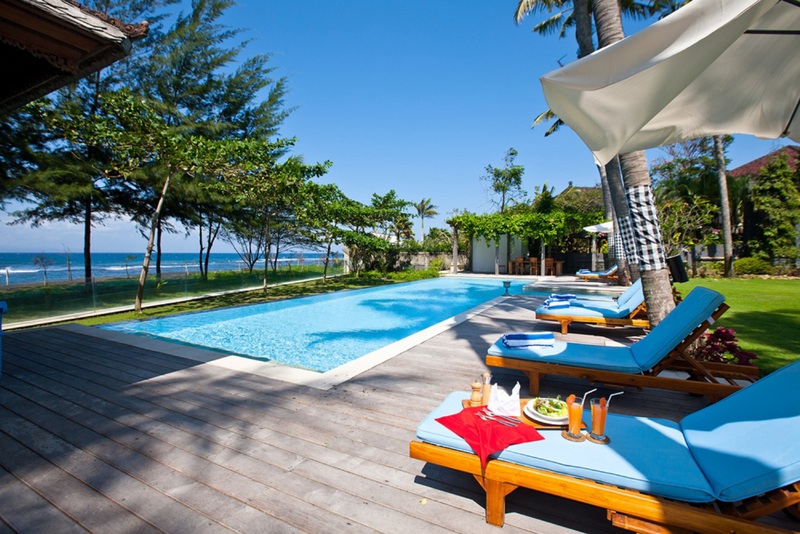 Puri Nirwana is supported by a carefully selected team of highly trained staff, comprising a villa manager, professional chef, butlers, villa attendants, gardeners, a pool attendant, and security guards operating on a 24-hour shift basis. 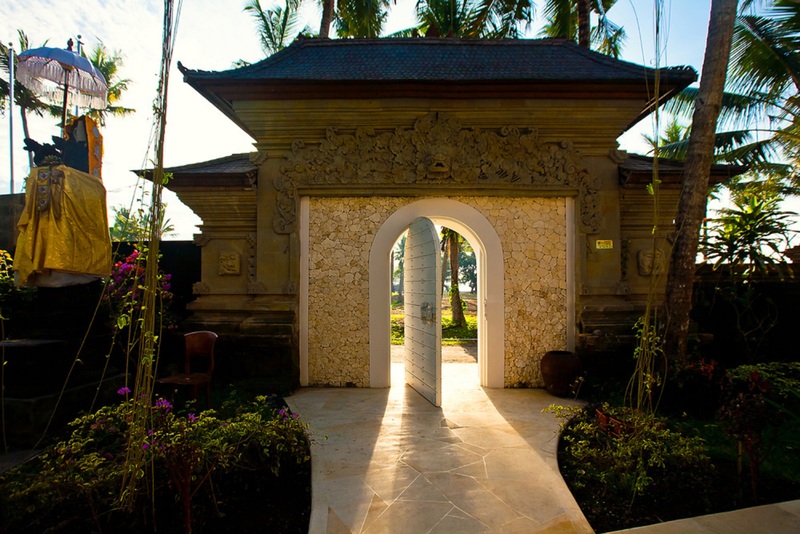 A car and driver is available (inclusive of villa rate for 8 hours per day) to transport guests to the many attractions of south-east Bali and beyond. Baby-sitting and spa services are also available. 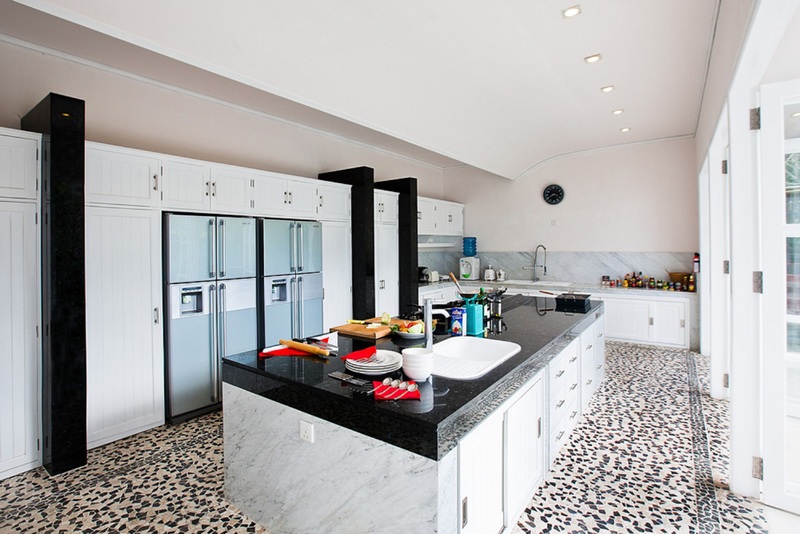 Some of the staff live on-site with their separate personal quarters located at the rear of the property. 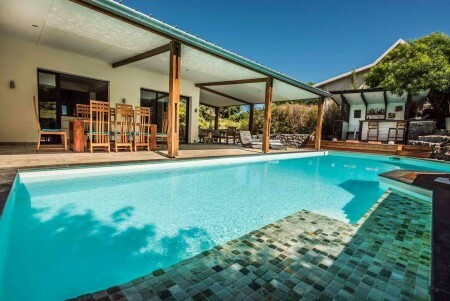 4 Bedrooms villa : US$ 1,095 in low season US$ 1,295 in high season (Easter holiday, 1.July-31.August) ++ subject to 15,5% government tax & service charge. Return airport transfers for entire groups (for bookings with a minimum three nights stay and made through management company only).